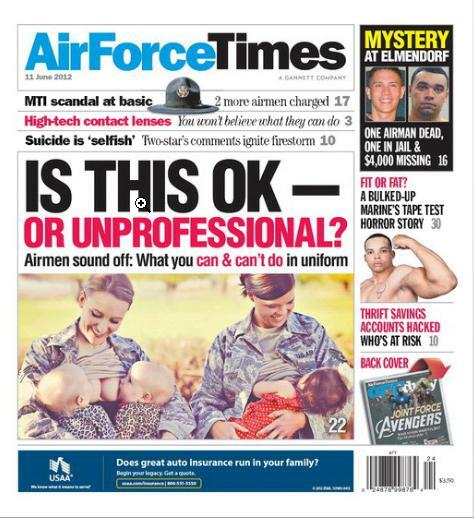 Yes, those are bare breasts on the cover of this week’s Air Force Times. Two airmen have appeared in a photograph showing them breast-feeding their babies while in uniform as part of a campaign for a breast-feeding support group, but when the image went viral, it caused a firestorm about whether nursing while in uniform is allowed. In other news, the mother of an airman based at Joint Base Elmendorf-Richardson, Alaska, whose body was found May 8 believes money may have been the motive for his death. Police have not charged anyone in connection with the death of Senior Airman Clinton Reeves, nor have they released a cause of death. And the Air Force is set to stand up a second team of emergency medical professionals who specialize in moving and treating wounded troops who have just been injured and are at risk of dying if emergency care is not immediately administered. The first team has successfully treated 299 severely wounded troops over the past year.